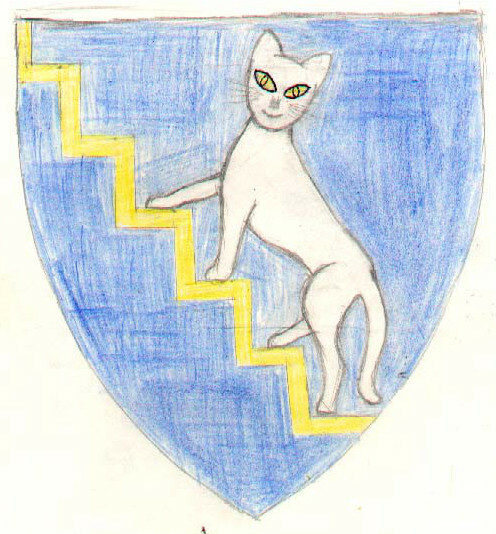 I needed some time off after the big push to get the Book of Traceable Heraldic Art into shape for Pennsic, but have made a bit of continuing progress on it this autumn. 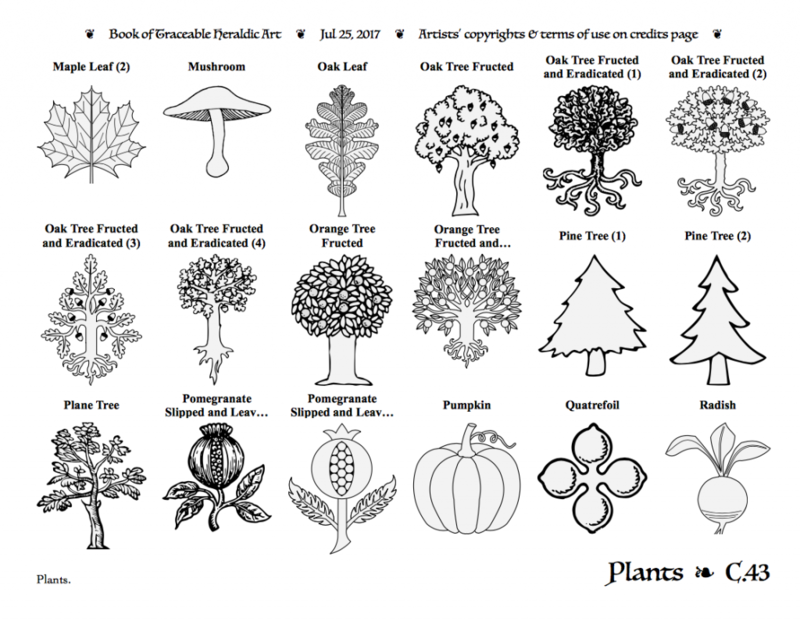 I’m also working on a new printable “catalog” layout that allows people to easily scan through design elements at a consultation table — it packs most of the tinctures, divisions, and charges into a compact format that’s a bit over fifty pages rather than a thousand. 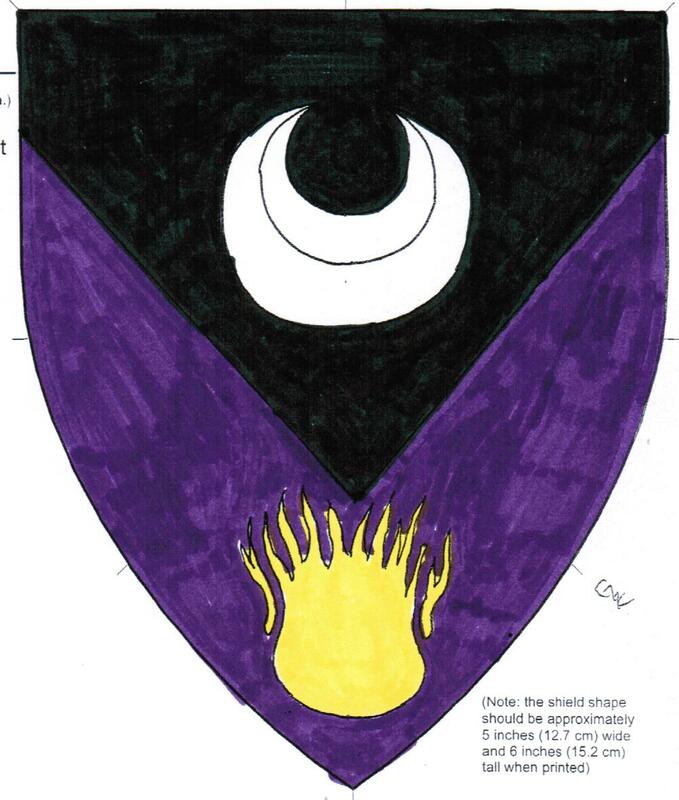 No armory will be registered to a submitter if it is identical to an insignia used by the submitter for purposes of identification outside of a Society context. This includes armory, trademarks, and other items registered with mundane authorities that serve to identify an individual or group. This restriction is intended to help preserve a distinction between a submitter’s identity within the Society and the submitter’s identity outside of the Society. Any change that causes a blazonable difference between mundane and Society armory is sufficient to allow registration by Laurel. So, if you have arms in the mundane world, you must make at least one minor change to them in order to register them in the SCA. Modern or historical armory belonging to individuals or corporate groups may be considered significant or recognizable enough to protect on a case-by-case basis. Armory is likely to be considered important enough to protect if the owner is associated with important administrative, social, political, or military events and the arms themselves are important or well-known. 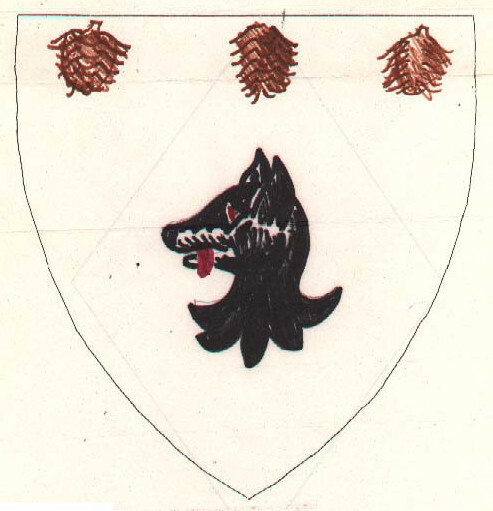 As we approach the 50th anniversary of Østgarđr, and indeed of the East Kingdom — because in the beginning, Østgarđr was the East — we’ve been looking back over our history, and in keeping with that project I thought I would catalog the armorial devices of the viceroys and vicereines of Østgarđr since the earliest days. Suuder Saran is the sixth viceroy of Østgarđr. 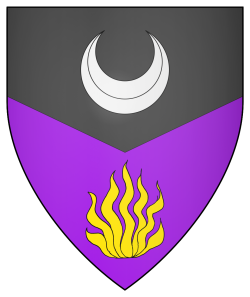 He bears Per chevron inverted sable and purpure, a crescent argent and a flame Or. Lada Monguligin is the fourth vicereine of Østgarđr. 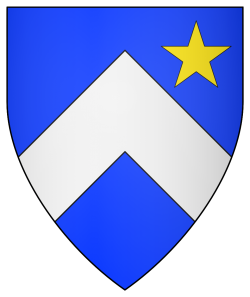 She bears Gules, a sans-serif letter “M” inverted surmounted by a pallet couped argent issuant from a trimount vert. 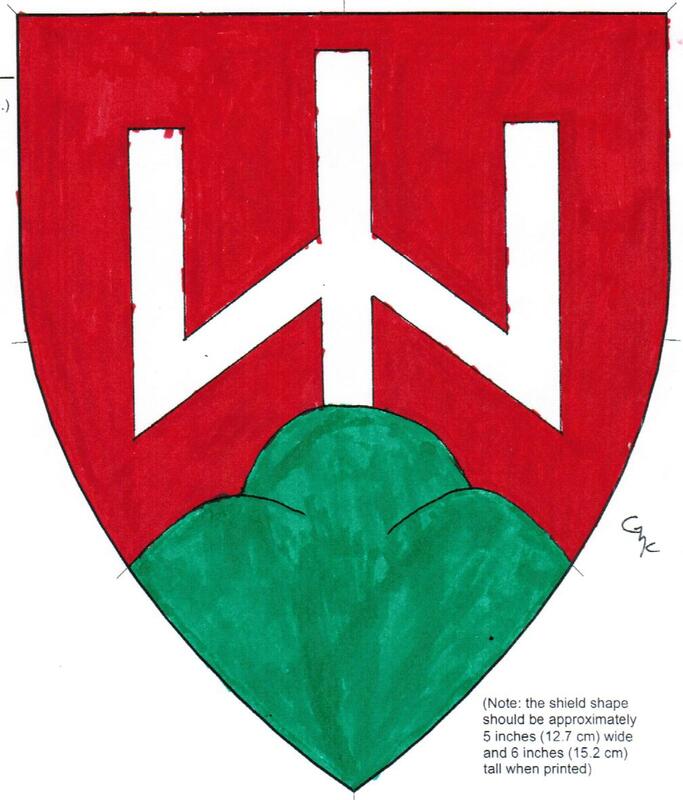 This design is evocative of traditional Eastern European coats of arms. Polish armory is known for most often using red fields bearing gold or silver charges. 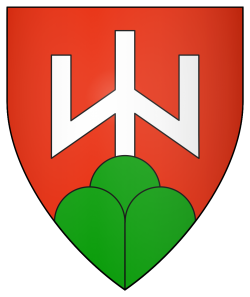 Polish armory is also notable for many charges based on geometric shapes, which are derived from tamgas, a system of brands and badges used to mark property by medieval Mongols and related Eurasian nomadic cultures. Hungarian armory frequently feature gold or silver charges emergent from a green mountain on a red field. The central charge here is reminiscent of the trident featured in the arms of Ukraine. The society does not have a lot of Eastern-European armory, so this submission provoked some interesting commentary at the kingdom and society level, and in the LoAR. 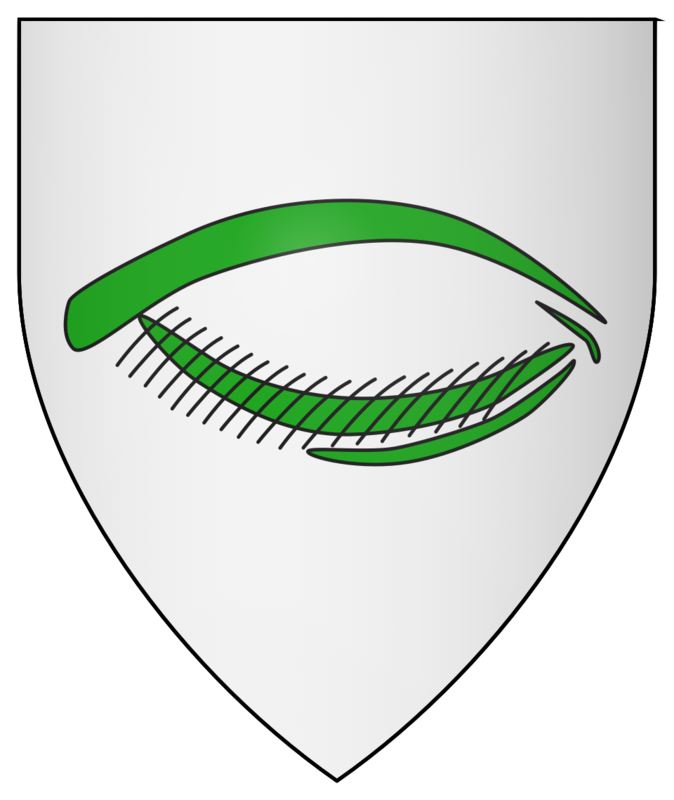 Gui avec Cheval de Guise was the fifth viceroy of Østgarđr. He bears Azure, a fleur-de-lys and on a chief embattled argent a hare courant contourny sable. Guise is a town in northern France. 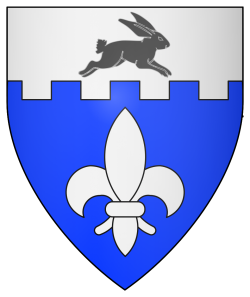 Registered May 1996 under the name Guy Cheveux de Guise. Johanne i Visby was the third vicereine of Østgarđr. 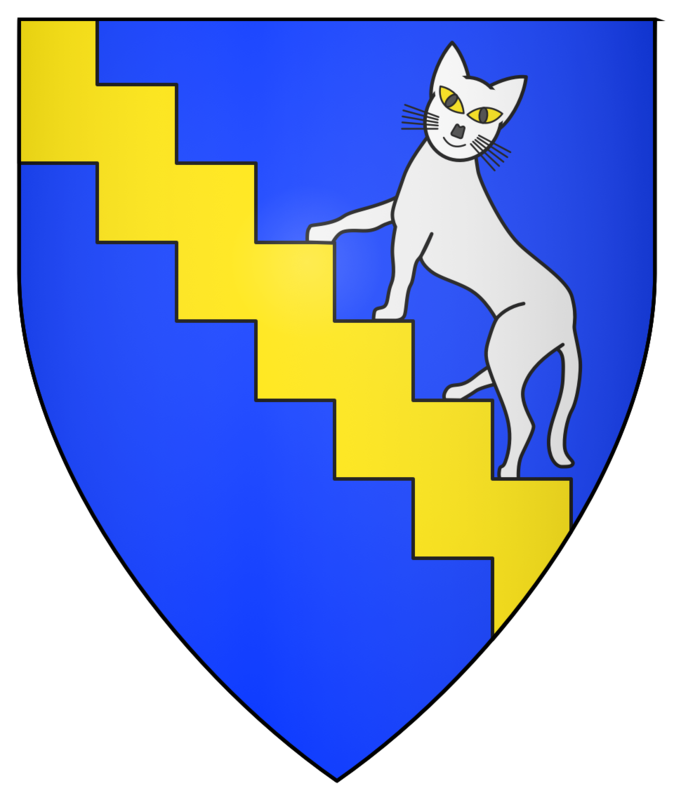 She bears Azure, a chevron argent and in sinister chief a mullet Or. Alexandre Lerot d’Avignon was the fourth viceroy of Østgarđr. 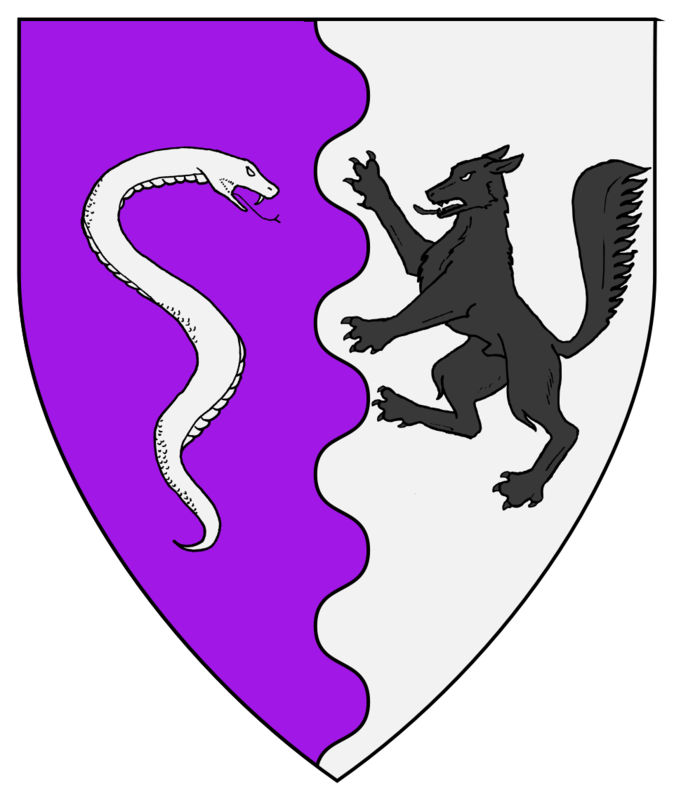 He bears Per pale wavy purpure and argent, a serpent, glissant palewise and sinister facing, argent and a wolf rampant sable. Eularia Trewe was the second vicereine of Østgarđr. 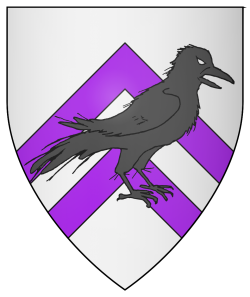 She bears Argent, two chevronels purpure and overall a crow contourny sable. 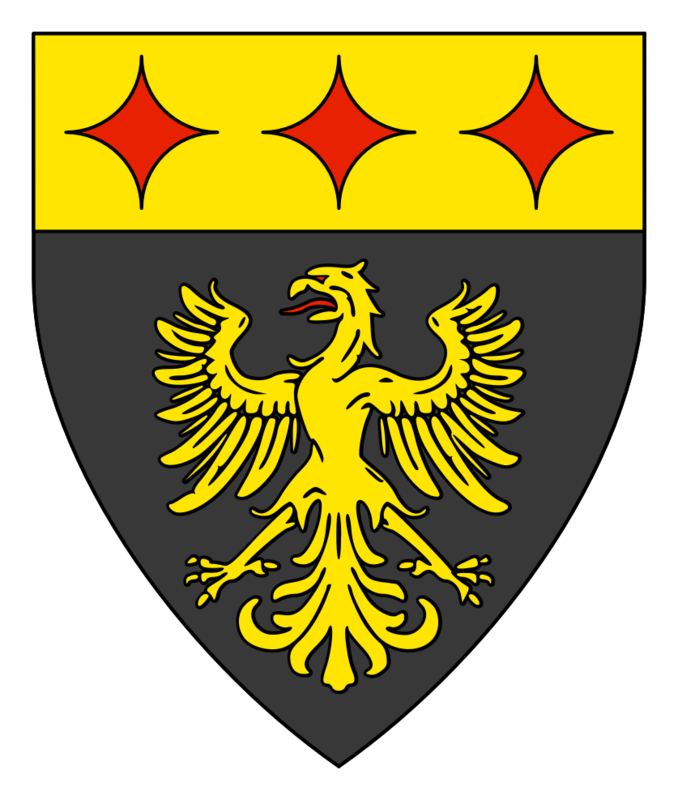 Ian of Clan Mitchell was the third viceroy of Østgarđr. He bears Azure, climbing a bendlet indented Or, a cat passant bendwise argent orbed Or. Katherine Gilliesfleur was the first vicereine of Østgarđr. 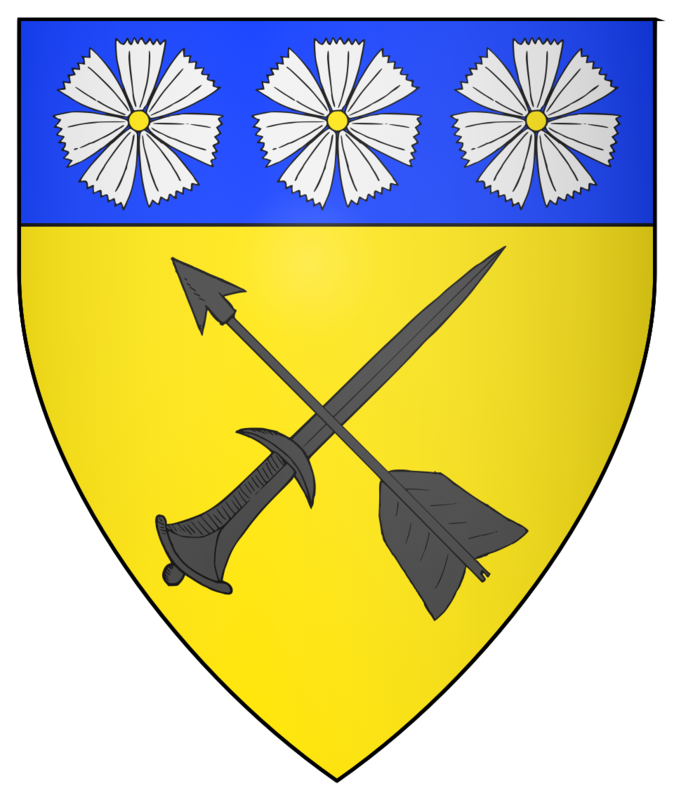 She bears Or, in saltire an arrow inverted and a dagger sable, on a chief azure three gillyflowers argent, seeded Or. The gillyflower is a medieval ancestor of the modern carnation. Cassandra of Bethel was the second viceroy of Østgarđr. 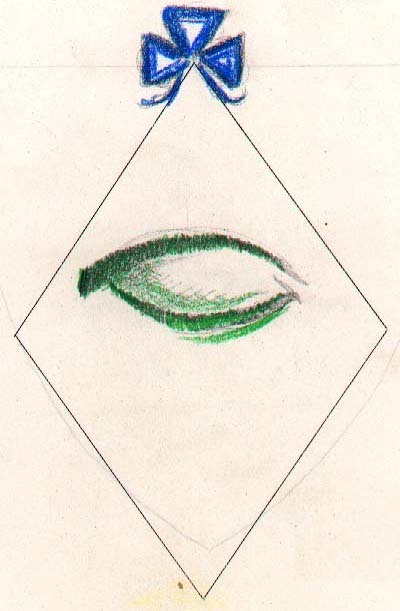 She bears Argent, a human eye lidded, chased vert. 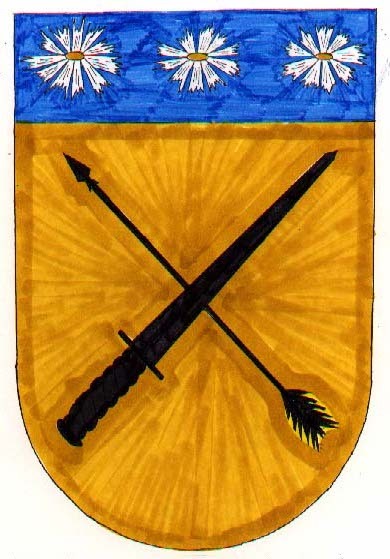 Vardak Mirceavitch Basarabov of Iloi was the first viceroy of Østgarđr, serving in this position for less than one year. 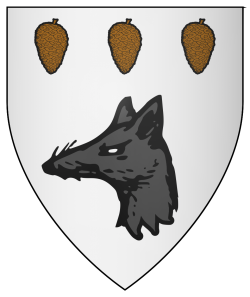 He bears Argent, a fox’s head erased sable and in chief three pine cones, stems to chief proper. Updated Nov 12: Thanks to some feedback on Facebook, I’ve corrected a mis-colored field both above and in the combined “poster” version that shows all of the arms in chronological order as a single image. Updated Jan 27: I noticed that I had incorrectly emblazoned Lada’s arms with a mountain rather than a trimount; this has been corrected.